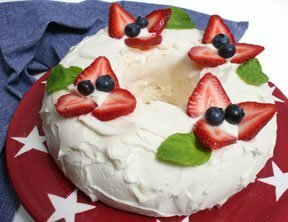 Create a festive 4th of July celebration with this Star Spangled Angel Food Cake. Everyone will enjoy this light angel food cake with its fluffy cream cheese frosting decorated with strawberries and blueberries. This red, white, and blue cake recipe is perfect for your 4th of July get-together. Create a patriotic touch to your 4th of July by adding some red, white, and blue to your celebration. See our tips on planning for a picnic, including recipe suggestions and information on how to pack a picnic basket.